Nikola Popara was born in 1975. He started to play the violin at the age of 8. After finishing both primary and secondary music school, he won a scholarship to study at the Musical Instrument Making School at Liszt Ferenc Academy of Music, Budapest. At the same time, as an intern at Paulus Saranszky’s workshop in Budapest, he studied making new violins and in addition repairing and restoring valuable old instruments. In 1999 he started to work on his own and since then he was continuously evolving the sound and aesthetics of his instruments through systematic research and feedback from clients and musicians. His instruments combine the traditional looks with a bright, full range and strong sound that meets the requirements of the modern musical scene and the needs of today’s musicians. 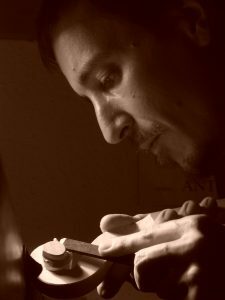 He is a member of the Association of Hungarian Violin Makers.